Trump Administration Wants To Reverse An Obama-era Lightbulb Efficiency Rule. The Trump administration wants to reverse a rule designed to make lightbulbs more efficient. Environmental groups say the change will cost consumers and waste energy. LED lightbulbs have replaced many incandescent ones. Now, the Trump administration wants to reverse an Obama-era rule designed to make a wide array of other lightbulbs more efficient. If it's been a few years since you shopped for a lightbulb, you might find yourself confused. Those controversial curly-cue ones that were cutting edge not that long ago? Gone. (Or harder to find.) Thanks to a 2007 law signed by President George W. Bush, shelves these days are largely stocked with LED bulbs that look more like the traditional pear-shaped incandescent version but use just one-fifth the energy. A second wave of lightbulb changes was set to happen. But now the Trump administration wants to undo an Obama-era regulation designed to make a wide array of specialty lightbulbs more energy efficient. At issue here are bulbs such as decorative globes used in bathrooms, reflectors in recessed lighting, candle-shaped lights and three-way lightbulbs. The Natural Resources Defense Council says that, collectively, these account for about 2.7 billion light sockets, nearly half the conventional sockets in use in the U.S.
A senseless rollback or an unlawful rule? At the very end of the Obama administration, the Department of Energy decided these specialty bulbs should also be subject to efficiency requirements under the 2007 law. The lighting industry objected and sued to overturn the decision. "DOE, in our view, exceeded its authority," says Clark Silcox, general counsel for the National Electrical Manufacturers Association. NEMA argued that Congress never intended for the law to apply to all these other lightbulbs. After President Trump took office the Energy Department agreed and proposed to reverse the agency's previous decision. "I just don't understand the rationale behind trying to turn back the clock," says Jason Hartke, president of the Alliance to Save Energy. "There aren't many people out there clamoring for outdated lightbulbs that use four or five times as much energy." There aren't many people out there clamoring for outdated lightbulbs that use four or five times as much energy. Critics say if the reversal is finalized it will mean higher energy bills for consumers and more pollution. "Now we're going to have to generate about 25 large coal-burning power plants' worth of extra electricity if this rollback goes through," says Noah Horowitz, a senior scientist at NRDC. He calls it a bad idea and says it's illegal. NEMA disagrees and also objects to the term "rollback." Backsliding on energy efficiency requirements is not allowed under federal law. "The Department of Energy cannot illegally roll back from a place that it could not legally stand upon in the first place," argues Silcox. Eventually a court likely will decide who's correct. Environmental groups vow to sue if the Obama-era changes are reversed. The lighting industry rejects claims that it just wants to continue selling existing styles of bulbs even if they use more energy. Silcox says companies are switching to more efficient lighting and are focused on, "What does their consumer want, and making sure that there is a high level of consumer satisfaction." The industry learned a hard lesson after the first generation of those curly compact fluorescent lightbulbs was released. "Consumers, basically, did not like them. They didn't buy them. They complained about them. We heard that loud and clear," says Jennifer Dolin, head of government affairs and sustainability at LEDVANCE, which manufactures Sylvania lightbulbs. 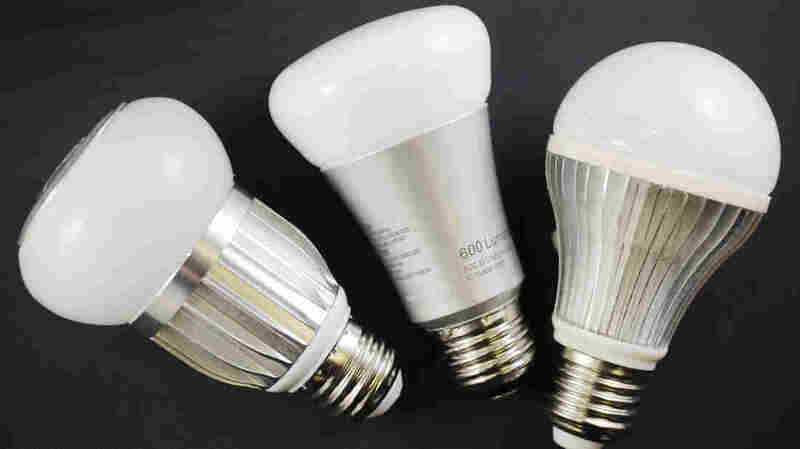 Dolin says the industry wants to make sure it gets the LED versions of all these other kinds of bulbs perfected before releasing them onto the market. She says more efficient bulbs are coming. "The future of lighting is LED, there's no doubt about that and we see that in the marketplace," she says. "We see that consumers are shifting to LEDs at a much more rapid rate than we ever anticipated." But given the mounting impacts of climate change, environmental groups argue this regulation is needed now to make that transition happen faster. As the expected court battle plays out, the Environmental Defense Fund is hoping retailers will take the lead and choose, on their own, to stock shelves only with energy efficient specialty bulbs. So far, no retailers have publicly responded to the group's call, though in 2015 IKEA announced it will sell only LED bulbs.